The 38th Annual IHRSA International Convention & Trade Show would not be possible without the generous support of a number of IHRSA’s Associate Members, who sponsor various activities and events throughout the Convention. We gratefully acknowledge their participation and commitment to enhancing our programming efforts. 9Round, a world leading kickbox-fitness franchise, has over 750 locations open in 15 countries. The program consists of nine workout stations with functional, interval, cardiovascular, and circuit training incorporated. The company has developed the Kickboxology training program to certify personal trainers in teaching boxing and kickboxing to their clients. Launched in 1981, ABC Financial has revolutionized software and payment processing for the health and fitness industry with our DataTrak software. ABC has become the choice of over 7,000 health clubs throughout the United States, Mexico, Canada and Puerto Rico. The Fitness Business Podcast interviews best selling authors, experienced coaches and industry experts every week. Since launching in 2015, over 210 shows have now been published and 300K+ downloads. We are your top podcast in the world to get quality education every week. Airex AG is a global market leader for gymnastics mats & balance products. This is on the basis of 50 years experience in foam technology. Exhaustively tried and tested materials and proven Swiss quality in the manufacturing process, guarantee a long service life for the products, even under heavy use. At Aktiv®, we amplify functional training areas for health clubs and specialty studios alike. Our mission is to establish safe, dynamic, and revenue-generating spaces, while our clients deliver inspirational exercise experiences. We craft tailored training environments with our Functional Training Ecosystem® - designed to drive your brand. ASF’s new Online Check-In is a tool that simplifies checking members in and signing up for classes and training events. Compatible with desktops, laptops, iPads, tablets, iPhones and Android devices, Online Check-In integrates with My Member Account Mobile App - a simple tool designed to steamline scheduling for members - by allowing members to easily check in using their personal barcodes, for a faster and more efficient check-in process for both owners and members. Since 2012, ChinaFit Fitness Convention and Trade Show has been held continuously. So far, ChinaFit Fitness Convention has become the largest annual event in Chinese commercial fitness field. Club Automation provides intuitive technology that’s flexible to fit your needs. A best-in-class, all-in-one club management solution that combines an easy-to-use interface with a powerful back-end to efficiently manage all aspects of your operations. Built by club owners, for club owners- we power your business. Over 3,000 fitness businesses use the Club OS software to simplify and streamline their sales, marketing, and retention efforts across one or hundreds of locations. Cultivate relationships with prospects and members, view in-depth reports, and elevate your sales team's performance. Eleiko offers complete free weight solutions, the finest bars, bumpers, platforms (including the sound and vibration reducing SVR Platform), dumbbells, benches and racks supported by Eleiko Education programs. Partner with Eleiko to outfit your facility with the right equipment and prepare your staff with the right knowledge to get the most out of your free weight area. FITNESS MASTER offers the full commercial STEELFLEX line of cardio and strength equipment. FMI has been in business since 2003. One of the highest quality full-spectrum, single-origin hemp oils. With seed to shelf oversight and a proprietary lipid infusion process, our products preserve cellular bonds to deliver a whole-plant entourage effect. Never from concentrate, our products have been third-party verified to deliver more active beneficial phytonutrients. The GENAVIX HealthyCARE® Network is a community and corporate wellness solution. The HealthyCARE® practice creates a significant profit center for each fitness or franchise fitness owner by monetizing their health coaches, fitness trainers and registered dietitians through health insurance reimbursements. The complexity of running a HIPAA compliant practice is managed by GENAVIX through its technology and practice management platform, which allows each member of the Network to focus on changing lives and growing their business. GENAVIX works with national and regional health insurance providers to deliver preventative and nutritional services in conjunction with proper fitness, behavior modification and stress management for reimbursements. HealthyCARE® assessments and intervention consultations are fully reimbursed through most commercial health insurance plans. If you’re looking to add nutritional counseling, diabetic prevention (DDP), or health coaching to your community offering, GENAVIX will show you how! Gympass attracts new, untapped users to fitness facilities by partnering with corporations to empower employees to become active and engaged. Across 14 countries, our team of 900 employees form long-term corporate relationships delivering continual traffic to clubs year after year. Helix Lateral Trainers created the category of cardio based lateral training which moves cardio training from single to multi-plane movement. Featuring patented multi-plane Helix Motion, the Helix works the inner and outer thighs, core, and glutes simultaneously thereby providing a comprehensive 360° lower-body workout. University studies show that when compared to a traditional elliptical, Helix training creates up to 44% more muscle activation in virtually every muscle group of the lower body and core, thereby delivering better results in less time. HydroMassage® Lounges and Beds are innovative amenities that feel great on sore muscles after a workout. From a financial perspective, HydroMassage is one of the most powerful tools to increase revenue per member. Plus, massage appeals to virtually all demographics, playing a key role to attract and retain more members. InBody is one of the most accurate DSM-BIA body composition solution used by the leading fitness experts in the industry. In less than 60 seconds, our devices provide an in-depth analysis of a client’s percent body fat, muscle mass, BMR and more. Providing world—class design, Intenza pioneers change through its user—centric, award—winning cardio products, produced in a socially responsible manner. Driven by innovation and inspired by technology, Intenza’s vision is a world where people live better, longer and healthier lives. Iron Grip builds its heavy-duty dumbbells, fixed barbells, weight plates, and Olympic bars exclusively in the US to survive the toughest workouts. Rely on Iron Grip for cutting-edge innovation and long-lasting performance. Since 1997, JumpSport has offered industry-leading innovation, quality, customer support, programming, education, and fun! JumpSport Fitness Trampolines combine club-proven bungee performance with no-tip safety, & low-maintenance. Stackable–saves space. Efficient, low-impact results for all ages. Highly versatile programming for PT, small group, group ex, and more. Get JumpSport certified today. Keiser is never satisfied with the status quo and strives to push the limits of fitness science. By beginning the design process with the human body rather than the limits of current technology, Keiser develops science backed solutions that break the widely accepted industry conventions to elevate human performance. LES MILLS programs changes the lives of millions of people every week. Our workouts are licensed by 19,500 partners in 100 countries around the world. We support our partners with research, marketing and new workouts every three months. Our tribe of 130,000 certified instructors bring those workouts to life every day. Matrix is one of the most trusted and recognized brands in the industry, loved by members, owners, trainers and service people alike. Our forward-thinking designs redefine the exercise experience making every interaction with our equipment smarter, easier and more enjoyable. Merrithew – Leaders in Mindful Movement – is a global leader in mind-body education and equipment motivating people of all ages and life stages to lead healthier lives. Merrithew has trained 50,000 professionals in over 100 countries in STOTT PILATES, ZEN∙GA, Total Barre, CORE Athletic Conditioning & Performance Training and Halo Training. MYE Fitness Technologies is one of the industry's largest and most trusted global providers of fitness entertainment and technology including the AppAudio Smartphone TV Audio system, health tracking technology, Cardio Machine TVs, wireless TV Audio receivers and transmitters, the Direct Connect and Wireless CableSAT Channel Changer and MYE Smart Digital Signage. Advanced product design makes MYE technology the choice of major cardio equipment brands and leading club operators. Myzone delivers a wearable and digital technology solution for the fitness industry. The wearable fitness tracker rewards effort when users work out. Myzone displays real-time heart rate using five color-coded personalized zones. The app allows engagement, motivation, and communities to flourish. It’s about making people feel good about exercise. Perfect Gym is an all in one enterprise Software as a Solution (SaaS) and is purpose-built to service the fitness industry. We provide fitness software solutions to customers in more than 50 countries all over the world. Our digital fitness management platform includes a CRM, Mobile App, Point of Sale, Client Portal, an innovative Machine Learning module to facilitate club operations and strategy as well as direct billing to simplify club-to-member financial interactions. Personal Fitness Professional (PFP) has been committed to helping fitness professionals of all levels prosper for 20 years. Much has changed since we launched our magazine in 1999, but one thing that hasn't is our commitment to helping you prosper as a fitness professional! Polar is an innovator in heart rate monitoring, activity and sleep tracking and GPS sports training solutions for elite athletes, coaches and active fitness enthusiasts. For over 40 years, we have helped athletes understand, track and improve their performance. Our award-winning product range includes pioneering sports wearables that work elegantly with Polar training apps and cloud services. Movement is energy. As a green fitness company, SportsArt harnesses the energy of human movement to make the planet more sustainable — one workout at a time. Our mission is to advance fitness industry standards by being one of the most creative and eco-friendly manufacturers of premium quality fitness equipment. Stop counting the reps. Start training to the beat. STRONG by Zumba® combines body weight, muscle conditioning, cardio and plyometric training moves synced to original music that has been specifically designed to match every single move. Every squat, every lunge, every burpee is driven by the music, helping you make it to that last rep, and maybe even five more. In each class you'll burn calories while toning arms, legs, abs and glutes. Plyometric or explosive moves like high knees, burpees, and jumping jacksare interchanged with isometric moves like lunges, squats, and kickboxing. STRONG by Zumba® instructors change up the music and moves frequently to make sure you’re always challenged to the max. Technogym is a leading supplier of Technology, performance, and design driven products and services in the Wellness and Fitness industry. Technogym provides a complete range of cardio, strength and functional equipment alongside a digital cloud based platform allowing consumers to connect with their personal wellness experience anywhere, both on equipment and via mobile device when outdoors. Texas Capital Bank, N.A. is a commercial bank that delivers highly customized financial services to businesses across the country, including credit and treasury solutions delivered through our specialized Franchise Banking team. Texas Capital Bank is a wholly owned subsidiary of Texas Capital Bancshares, Inc. (NASDAQ: TCBI) and is recognized as one of Forbes Best Banks in America, Member FDIC. Torque Fitness designs and manufactures innovative functional and performance training equipment for commercial settings. We believe that every strength training facility should be equipped with the most innovative, intuitive, and engaging strength training equipment possible. As an industry leader in functional workout equipment, we get closer to this goal every day. Trainerize is leading technology innovation by creating a connected and digital experience for fitness club members and digitizing the world of personal training. Through its proprietary software and mobile app, Trainerize is empowering 80,000 fitness businesses worldwide to further reach, engage, and motivate people through technology. For over three decades, TRUE has been dedicated to building easy-to-use commercial fitness equipment that combines innovation with dependability. TRUE is a global leader in premium fitness machines, offering unparalleled service and providing peace of mind to our customers at every step. We enable our clients with intuitive software, integrated payments, valuable services and support, with intelligent insight so they can master their business management processes and complete their customer experience. TSG has deep domain expertise serving a range of verticals in the subscription economy including health and fitness, entertainment, childcare, and insurance. Across our portfolio, we understand the importance of a configurable solution for each of our client’s unique business needs. Twin Oaks offers comprehensive, user-friendly Cloud based web software that makes day to day operations easy to navigate. It has every resource to register new members, prospects, offers electronic agreements, a built in CRM, Online Joining, a full Point of Sale system, and all billing functionality. It utilizes intelligent and intuitive programming for key features and benefits, 24/7/365 door access control, email blast capabilities, automated management reports, and numerous other important items. In addition, it is all backed with superb customer service, support, and industry leading credit card rates, translating directly to more revenue and profits for club operators. Talk to Twin Oaks, and learn why they've been an industry leader for 28+ years, have a strong reputation, and resume of success. The Key to Retention...Virtuagym is the leading software solution for coaching & amp and member engagement. Virtuagym offers a complete ecosystem with one of best-in-class mobile apps and solutions for exercise and nutrition guidance, scheduling, online sign-up, online payments, access control, and more. 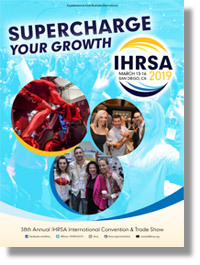 Check out the WaterRower group-x experience at IHRSA 2019! CANFITPRO and IDEA World Presenter of the Year, Sgt. Ken and our team will help get your heart pumping during our WaterRower Crew Conditioning™ class; afterwards, connect with the us to discuss how you can bring our industry-leading education and rowing machines to your club with an all-inclusive launch package. “IHRSA is a refreshing reminder we are all in this together. I love that IHRSA is an ambassador on all clubs’ behalf. … Grateful for all efforts made by IHRSA to see this industry continue to excel. ROI on all information shared at IHRSA is priceless!